Using a Master To Do list lets me sleep at night. Managing a home is hard work. Some days there’s too much that needs doing and too little time to do it all. We do what we can, and then plan to get around to the rest at first chance. The next day, they’re wholly forgotten… until we try falling asleep. Given the nature of my blog, I’m often asked by busy moms for advice about how to accomplish more. It all comes down to organization, but not the kind that word usually brings to mind. This kind doesn’t involve cute containers or labels; it’s not about alphabetizing things. It’s about seeing the big picture of what needs to be done around one’s home, then zooming in on details as time permits. 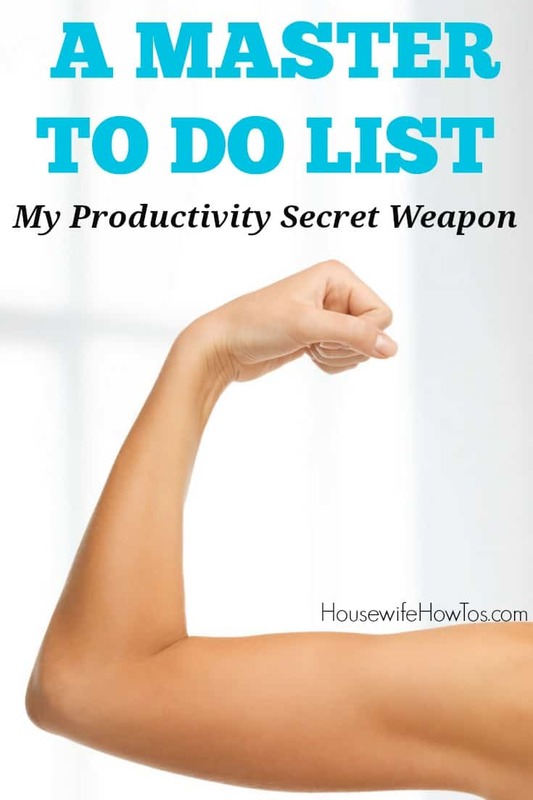 To do this, I use a Master To Do List, and it’s my productivity secret weapon. A Master To Do List is a catch-all list of tasks that you’ll get to when you’ve got the time and energy to do them. Long daily To Do lists overwhelm me and rob my days of joy. Accomplishing everything on a long list might feel productive, but it also makes me feel like a drudge. On the other hand, if I don’t finish a daily To Do list I feel guilty. So, I keep my Daily To Do list limited to a handful of things: usually the daily cleaning routine plus giving one room it’s weekly cleaning and then tending to a monthly or seasonal chore. Total time: roughly 30 minutes in the morning and 30 more in the afternoon. Tops. If I have the time and energy, I add something from my Master To Do List (MTDL) to my daily list of tasks — but I never feel sorry if I’m not up to it. I know I’ll get to them one day, and since I’ve written them down, I also know that I won’t forget. Besides keeping a daily list of tasks manageable, an MTDL helps in some other ways. Eliminates brain clutter. 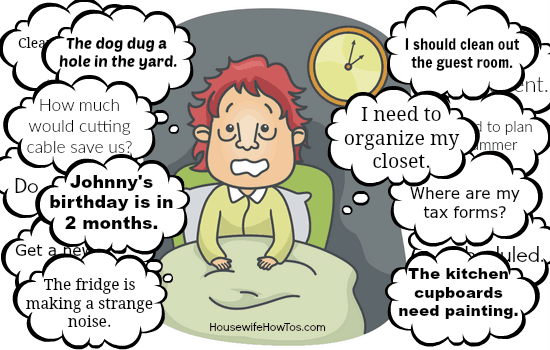 Our brains are busy with other thoughts during the day, but oh how they like to remind us of forgotten tasks the instant we climb into bed. Then, despite being weary, we can’t sleep due to all of the should/need/must-do items popping into our heads. An MTDL puts an end to that cycle by moving those tasks out of your head and onto paper. Overcomes distraction. You know how you set out to clean the bathroom then got distracted by the clutter in the cupboard under the sink? An hour later, when it’s time to make dinner, the bathroom is still dirty, and all you have to show for your effort is a cupboard that no one but you looks into anyway. With an MTDL you can stay focused on cleaning the bathroom then come back to organize the cupboard when you’ve got time. Reduces wasted time. I don’t think every minute of our days should be spent doing chores, but let’s be honest: some tasks take less time than checking Facebook or email, and they leave us feeling better afterward, too. With an MTDL, you can easily find a 5-minute task to fit in while waiting for the kids to finish brushing their teeth before bed or you’re waiting for the washer to finish running. Convinced you need a Master To Do List yet? Read on! Choose a simple format. When I began using an MTDL, I created a spreadsheet that I could access from both my laptop and phone. Although I’m a tech-savvy person, it wasn’t long before that system drove me crazy. The phone’s smaller screen made it burdensome to browse for tasks to do in the time I had available, and syncing glitches meant my phone and laptop versions didn’t always agree. Make sure it’s portable. 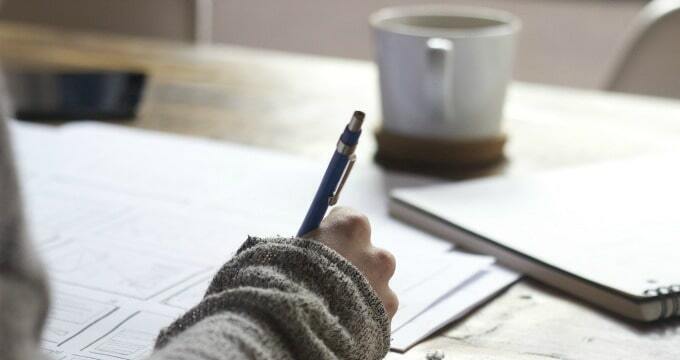 Once I switched to a notepad and pen, my reliance on and use of my MTDL took off. I keep my notebook on the kitchen counter throughout the day and pop it into my purse when leaving the house — just as I’d do with my phone, but without all of the other issues. Use columns to organize, not numbers. Most of us think of To Do Lists as being numbered or somehow prioritized, and that’s precisely how a daily To Do List should work. 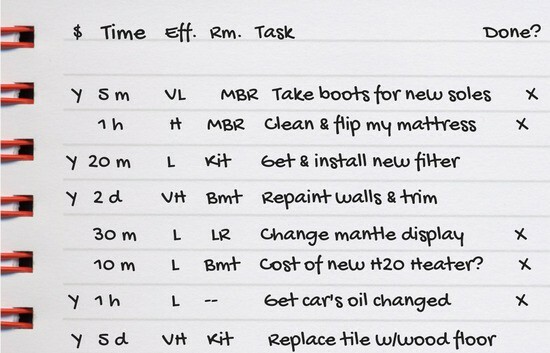 Not so with the MTDL — it’s an ongoing, unprioritized, running log of tasks you intend to get to at some point. The columns I use let me know if there’s an errand or cost involved ($), how long I think the task will take (Time), and where to do it (Room). I also note how much effort a job will take (Eff) so I can fit in very high effort (VH) tasks when I’ve got a lot of energy, and low or very low effort tasks on days when my arthritis is flaring. Walk through your home as you create your list. Right at this very moment, you can probably think of a dozen or so things you’d like to do around the house. Add them to your MTDL list but don’t stop there. Get up, taking your list with you, and go through every room in your home. Open every closet. Poke through every cupboard. Write down every single thing you want to change, clean, organize, fix, etc. Nothing is too small or too large! Spend hours filling out your list. Go crazy. Yes, this means accomplishing nothing while you make your list, but that’s fine. The purpose is to get all of this stuff onto paper. You’re not committing to doing them in the next week or even the next month — you’re just creating a list of things that you’d like to accomplish at some point. Incorporate tasks into your existing routine. Before cleaning your bedroom, for instance, skim your MTDL to see what else you’ve wanted to accomplish in that room. Maybe your list includes washing your pillows. Now’s the time: launder them while cleaning your bedroom and you can mark that task done. Running errands? Check your list first! Update your list as needed. Every so often I’ll find myself in the middle of doing one task and think of another. That’s where a portable list is essential: it’s easy to grab, jot down a note, and go back to what you were doing. It’s also a good idea to do another home walkthrough every so often to see if there are new tasks you want to add. Don’t go it alone. Just because you created the MTDL doesn’t mean you’ve got to be the only one who works on it. When the kids complain they’re bored or they want extra spending money, give them a task from your MTDL. Incidentally, a Master To Do List makes a great starting point for your spouse’s “Honey Do” list, too! Katie, thank you so much for posting this detailed article! I’m at home with the kids right now, my head is cluttered with things I need to do but I decided I am not going to start anything until I figure out a way to organize it all in my head. So I did a quick google search on how to organize a master list and came across this awesome article. I’m totally going to grab a notebook and start this. I’ve been trying to type out all my to do’s on a word doc and prioritize each item and it was driving me crazy, so I love what you wrote about how the master list is “an ongoing, unprioritized, running log of tasks you intend to get to at some point.” This literally was such a freeing sentence for me. The thing that keeps me from truly getting things under control is that I am trying to make things too perfect – the perfect to do list, the perfect planner, etc. I think that just getting pen to paper and get it out of my head, even though it’s not neatly typed is what I need to do. So thank you! I do this too! It def helps me sleep at night. I have my daily planner w my to do list and if I finish that and have time, I check out my MTDL. Isn’t it wonderful not having to keep all of that stuff in your head all the time?